The Ravioli are really delicious to eat and very tasty. They are of course Gnocchi but stuffed and fried but dear me, they are the most fiddly things in the world. 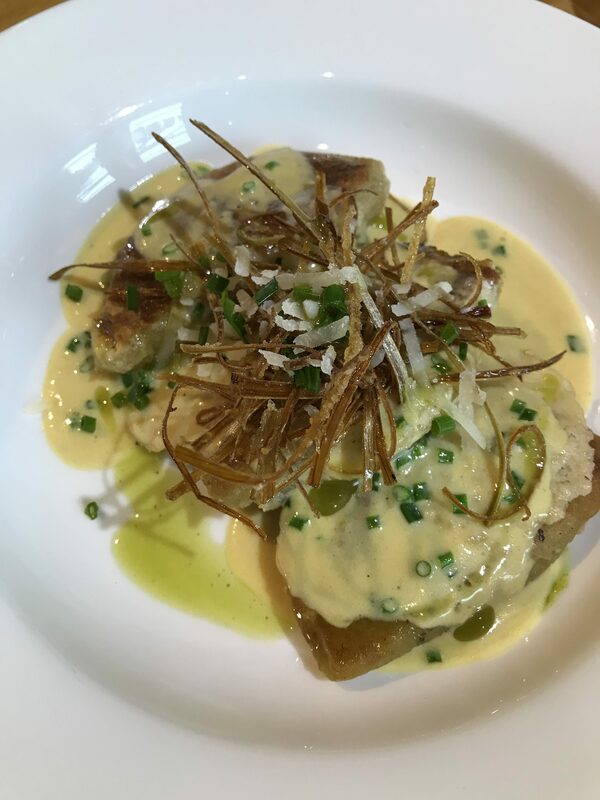 Served with rich Cream of Leek Sauce, crispy julienne of Leek and Parmesan Crisps. Finished with Chives and Basil Oil. Salmon portions were too big but nothing I could do. The Potato Gratin was very creamy and tasty and the Lemon and Caper Butter Sauce was very deep and rich having had all of the fish and vegetable trimmings. Served with buttered Spinach. I worked really hard at this Cheesecake and whilst it tasted great it still didn’t look brilliant. Need to refine the finish. The jelly was a treat though.